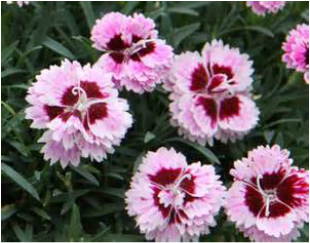 Lavender Eye Dianthus is also known as Sweet William and is an old fashioned cottage garden favorite. This is a variety that has a compact habit. It has fragrant pink with a crimson red center flowers. These will bloom from early spring to early summer. The foliage is grass like and gray-green. Lavender Eye Dianthus likes full sun. It will grow to a height of 8" to 12" and 12" to 14" wide. It will benefit from shearing back after the first flush of blooms. The foliage is nearly evergreen, so do not cut back for winter. Keeping the flowers deadheaded will increase the blooming time. Use Lavender Eye Dianthus for edging, ground cover, massed in a perennial or landscape bed, containers, covering banks, cascading around rocks or over walls. This plant will go well in a cottage garden or try it in a moon garden. Lavender Eye Dianthus attracts butterflies and makes an excellent cut flower. It is deer resistant and drought tolerant once it is established.